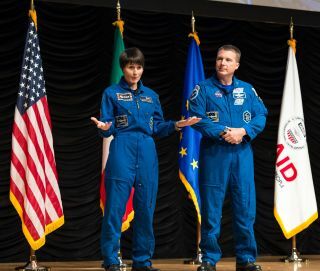 Astronauts Samantha Cristoforetti of the European Space Agency, left, and Terry Virts of NASA speak about their time aboard the International Space Station at the United States Agency for International Development (USAID) town hall on Thursday, September 17, 2015 in Washington, DC. The benefits of spaceflight extend far beyond the borders of countries capable of launching satellites, NASA officials say. On Thursday (Sept. 17), officials with NASA and the U.S. Agency For International Development (USAID) showcased the ways space science connects to developing countries as well. For example, the International Space Station (ISS) passes over some 90 percent of the inhabited area of the Earth, and does so in 90 minutes. Astronauts can take pictures of the surface of the Earth, tracking land use or wildfires, using the ISS SERVIR Environmental Research and Visualization System (ISERV), which is basically a small telescope attached to a digital camera that looks out a window. If something happens — perhaps a small-scale disaster like a local flood, fire or volcanic eruption — and local authorities need a picture quickly, ISERV can provide it. This happens in conjunction with a wealth of satellite images that NASA gathers every day. "We've improved warning time about floods in Bangladesh, provided tea industry growers in Kenya a tool that predicts frost before it damages their valuable crops and helped Central America reduce the health impact of harmful algal blooms," said USAID associate administrator Eric Postel. This information comes from satellite data, which, he added, is free and available to the public. NASA Administrator Charles Bolden said that, while many people think of NASA in terms of deep-space missions, Earth observation is a big part of what the agency does. NASA Administrator Charles Bolden speaks about the partnership between NASA and the United States Agency for International Development (USAID) at the USAID town hall on Thursday, September 17, 2015 in Washington, DC. "NASA is deeply committed to Earth science," Bolden said, citing the recently launched Soil Moisture Active Passive (SMAP) satellite as an example. "SMAP supports responses to fire, floods, and dust storms." During the discussion, Jennifer Frankel-Reed, senior climate change specialist at USAID, said satellite mapping data has benefitted flood-prone areas in Southeast Asia. Using river-height data, a NASA scientist was able to provide more warning for floods. "We've gone from five days' warning up to eight days' lead-time warning," Frankel-Reed said. She noted that a recent flood might have taken thousands of lives, but the advance warning meant that only 17 people died. Another program monitors "red tides" — algal blooms in coastal waters that can generate high levels of toxins — in Central America. This work allows local governments to direct fishermen to areas where there is no red tide, or to stop fishing altogether until the problem clears. Helping people on the ground in this way often involves linking university students in both the United States and the developing world. Carrie Stokes, geospatial information technology advisor at USAID, described a program called Mapping for Resilience. The two groups of students work together to map parts of the world that haven't been covered yet, using NASA data, Stokes said. It's not just robotic spacecraft that can offer beneficial orbital perspective. Two astronauts, Terry Virts of NASA and Samantha Cristoforetti of the European Space Agency, opened up the discussion with stories of their time on the ISS. "When you look down on Earth from space, you usually don't see borders," Virts said. "In Europe, it's kind of a continuous stream of the continent … Same thing across Africa." But some places aren't like that. He spoke of the difference between India and Pakistan, or North and South Korea. "By far the most visible from space is the North Korea-South Korea border… You really see it at night," Virts said. "You just think what a total disaster that is." The night side of Earth, he said, shows the stark differences between nations. "What you see is not population centers; you see wealth." There are many places where it's still dark at night despite the presence of millions of people, Virts noted. The ISS itself, Cristoforetti said, "is a testament to what we as human beings can do if we're able to care about something, if we have something big we want to achieve." One thing that being on the ISS brought home, she added, is that crewmembers have to take care of each other. "It's everyone's responsibility to make sure everyone else is doing well," Cristoforetti said, adding that the same lesson applies to Earth. "Earth is really a spaceship," she said. "It's bigger, and it's been there a long time, but it's a spaceship… and we have to take care of each other." Beyond the perspective from orbit, though, the goal is to make good use of data. "The ultimate goal is to turn data into decisions," said Frankel-Reed. Dan Irwin, director of NASA's SERVIR Coordination Office, said history shows why tools from space are important. "I did a lot of work on Maya archeology. Around 800 AD, their civilization collapsed, and a lot of people think it was climate change," Irwin said. "Had the Maya had the tools — had they had the ability to look from space — could they have done something?"